Celiac disease (CD) is an intestinal malabsorption characterized by intolerance to cereal proteins accompanied by immunological responses to dietary gliadins and tissue transglutaminase, an autoantigen located in the endomysium. Tissue transglutaminase belongs to the family of enzymes that catalyze protein cross-linking reactions and is constitutively expressed in many tissues as well as being activated during apoptosis. The role of gliadins in eliciting the immune response in CD and how transglutaminase is linked to the primary reaction are still unclear. In this work, we report the production and analysis of six phage Ab libraries from the peripheral and intestinal lymphocytes of three CD patients. We were able to isolate Abs to transglutaminase from all intestinal lymphocytes libraries but not from those obtained from peripheral lymphocytes. This is in contrast to Abs against gliadin, which could be obtained from all libraries, indicating that the humoral response against transglutaminase occurs at the local level, whereas that against gliadin occurs both peripherally and centrally. Abs from all three patients recognized the same transglutaminase epitopes with a bias toward the use of the VH5 Ab variable region family. The possible role of these anti-transglutaminase Abs in the onset of CD and associated autoimmune pathologies is discussed. Celiac disease (CD)4 is characterized by intestinal mucosal injury and malabsorption precipitated by dietary exposure to wheat gluten and similar proteins in rye and barley (1), with gliadins, specific antigenic determinants found in wheat gluten (2), playing a prominent role. Patients suffering from CD have serum Abs recognizing gliadin as well as an endomysial autoantigen, recently identified as being tissue transglutaminase (tTG) (3), an enzyme catalyzing Ca2+-dependent cross-linking between glutamine residues in peptides and some polyamines and primary amino groups. 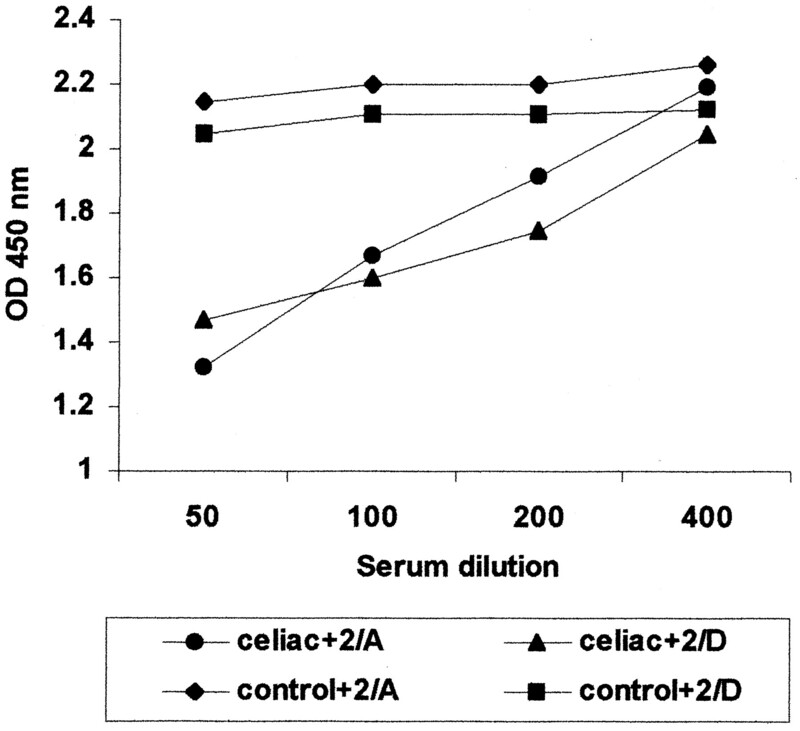 The Ab levels against both Ags increase on exposure to glutens and decrease on a gluten-free diet. Gliadin peptides have been shown to be presented to Ag-specific T cells at the intestinal level by HLA class II Ags (4), and this may explain the strong association with HLADQ2 (5). The role of tTG in the disease is still unknown, although it has been proposed that this enzyme is involved in the activation of gliadin peptides (6), thus leading to their toxicity. Simultaneous modification of tTG may then lead to an increase in immunogenicity. This may explain the finding that gliadin treatment of in vitro intestinal biopsy cultures can lead to the synthesis of antiendomysial Abs (7). Phage display of human Ab fragments has proved to be an effective method to investigate in vivo Ab responses in autoimmune disease (8, 9, 10). In this method, a patient’s Ab repertoire is expressed fused to the coat protein of a phage vector that carries the encoded protein gene (11), with each phage carrying a single Ab specificity. In this study, we describe the display of Ab repertoires derived from either intestinal biopsy lymphoctes (IBL) or PBLs from three patients with CD and show that whereas gliadin responses could be selected from all libraries, the tTG response was restricted to the IBL, with most Abs displaying recognition of a single epitope and associated with a highly restricted VH gene family. DH5aF′ (F′/endA1 hsdR17 (rK− mK+) supE44 thi-1 recA1 gyrA (Nalr) relA1 D (lacZYA-argF)U169 deoR (F80dlacD(lacZ)M15)) was used for phage propagation. HB2151 (K12, ara Δ(lac-pro), thi/F′ proA+B+, lacIqZΔM15) was used to make soluble single-chain variable fragment (scFv). pDAN5 (12), was used for scFv display. Molecular biology enzymes were purchased from New England Biolabs (Beverly, MA), Promega (Madison, WI), or Life Technologies (Rockville, MD), respectively. Total RNA was prepared as in Ref. 13 from 10 ml of PBL or IBL from three previously untreated CD adult patients with high titers of anti-α-gliadin, anti-human tTG (anti-h tTG), and endomysial Abs. All the patients had HLA-DQ2 histocompatbility Ags. PBL were purified by Ficoll Hypaque (Pharmacia, Piscataway, NJ), and IBL were treated directly. cDNA was synthesized by using random hexamers and SuperScript II reverse transcriptase (Life Technologies). Ig V regions were amplified by using specific V region primers (14) and assembled into scFv as reported in Ref. 15 before cloning into pDAN5. Purified α-gliadin was prepared as described (16). Guinea pig tTG (gp tTG), BSA, and lysozyme were purchased from Sigma (St. Louis, MO). h tTG cDNA was obtained by amplifying cDNA from an intestinal biopsy with specific primers (17) and cloning into pTrcHis (Invitrogen, San Diego, CA). The tTG was extracted as soluble cytoplasm fraction and purified by nickel nitrilotriacctic acid chromatography (Qiagen, Chatsworth, CA). Rescue of phagemid particles was as described in Ref. 18 . Panning was performed by adding phages diluted in 2% nonfat milk in PBS (MPBS) to immunotubes (Nunc, Naperville, IL) coated with purified h tTG or α-gliadin (10 μg/ml), washing 20 times with PBS 0.1% Tween 20, and 20 times with PBS, followed by elution with 1 ml of Escherichia coli cells at 0.5 OD600 for 30 min at 37°C and overnight growth after addition of ampicillin, helper phage, and kanamycin. The panning procedure was repeated up to three times. After selection, 48 individual clones from each selection were screened for reactivity to their respective Ags as well as irrelevant Ags (BSA and lysozme) by microtiter plate ELISA (18). Phagemids from individual colonies were infected into HB2151, grown to OD600 0.2, induced with 1 mM, isopropyl-β-d-thiogalactopyranoside, and further grown overnight at 28°C. scFv were used directly as supernatants of induced bacterial cultures. ELISA was performed with soluble scFv essentially as described for phage particles. Culture supernatants containing scFv were serially diluted with MPBS, added to microtiter plate wells, and detected with a mAb recognizing the SV5 tag (19) found at the scFv C terminus, an HRP-conjugated secondary anti-mouse Ig antiserum (Dako, Carpinteria, CA), and 3,3′,5,5′-tetramethylbenzidine dihydrochloride as substrates. Competitive ELISA was performed as conventional ELISA, except that 100 μl of individual scFv diluted 1:10 with MPBS was mixed with equal volumes of serially diluted CD sera positive for tTG. Immunofluorescence was performed on histological sections of human umbilical cord prepared according standard techniques. scFvs from bacterial culture supernatant were added to the sections, incubated for 30 min at room temperature in a moist chamber, followed by mAb SV5 and FITC-labeled anti-mouse IgG (Dako). Double labeling was performed by adding CD sera, diluted 1:200, to the same section and revealed with tetramethylrhodamine B isothiocyanate-labeled anti-human Ig antiserum (Dako). The scFv libraries were constructed from either PBL or IBL from three untreated adult CD patients with high anti-α-gliadin and h tTG Ab titers, the latter determined both by anti-endomysium Abs assayed on human umbilical cord sections as well as h tTG ELISA (20). The biopsy materials were obtained from patients undergoing intestinal biopsy to confirm their diagnoses. VH and VL chains were amplified from PBL and IBL cDNA by PCR using a set of oligonucleotides that recognize all human V genes (14). For the VH chains, the 3′ primer was specific for IgA Abs. VH and VL amplificates were assembled by PCR (15) and cloned into the phagemid vector pDAN5 (12) to obtain the primary libraries. The six libraries ranged in size from 5 × 106 to 5 × 107, and 20 clones picked at random from each were shown to contain full-length scFv with different BstNI restriction pattern, confirming the diversity and integrity of the libraries. The libraries are reported according to the donor patient, and given reference numbers 2, 3, and 4. Abs were affinity selected on purified cloned h tTG or α-gliadin. According to this method, V genes derived from a patient’s lymphocytes are used to express a patient’s Ab repertoire fused to the coat protein of a filamentous phage vector. Each phage carries a single Ab specificity and can be selected by subjecting the phage library to recursive rounds of binding, washing, and elution on the target Ag. After every cycle of selection the eluted phages were reamplified for the next cycle and tested by ELISA against the Ag used for the selection. When the polyclonal signal of the eluted phages was positive by ELISA, the selection was considered concluded, and 48 individual clones were analyzed from each selection. This was adopted to avoid overgrowth of deleted (21) or well-expressed positive clones during the cycles of amplification. Clones positive on the Ag used for the selection (tTG or α-gliadin) and negative on control Ags (BSA and lysozyme) were analyzed by BstNI fingerprinting and sequencing to determine the number of different clones, and these results are reported in Table I⇓. Interestingly, after only one cycle of selection, all three IBL libraries showed a variable number of positive clones to h tTG, whereas no positive clones to tTG were obtained after three cycles of selection with the PBL libraries. To further control this result, the antigenic quality of the cloned h tTG was assessed by using a large naive library described in Ref. 12 . This was prepared from Vμ, Vλ, and Vκ genes with an estimated diversity of 7 × 107 different VH and VL genes recombined to a final estimated diversity of 1011. After two cycles of selections, 12 different clones to tTG were identified, confirming that the failure of the PBL selections was not attributable to the low efficiency of the system in isolating rare scFv but rather to the lack of such Abs in the libraries. In contrast, different Abs against α-gliadin were obtained from all six CD libraries, as well as the naive library after two rounds of selection. The total number of positives and different positives clones is reported in Table I⇓. The V genes from the different anti-tTG scFv clones were sequenced and the VH and VL families as well as the gene segments used were assessed by screening against the VBASE (http://www.mrc-cpe.cam.ac.uk/imt-doc/restricted/ok.html) database (22) (Table II⇓, columns 2 and 5). The amino acid sequence of the complementarity-determining regions (CDR3) are reported in Table II⇓ (columns 3 and 6), and the numbers of silent (S) mutations leading to base substitution or amino acid replacement (R), for VH and VL, determined by comparing the V sequence to the closest germline sequence, are reported in columns 4 and 7. On the basis of the features reported above, scFvs selected from the three libraries (2, 3, 4) were grouped according to the VH family, the CDR3 sequence, and the framework mutations. Clones with similar CDR3s with a limited number of mutations in the other parts of the molecules (CDR1, CDR2, and framework regions) were considered to be derived from the same ancestor and assigned to the same group, but given different reference numbers (column 1). In general, VH gene use was restricted to three (VH5, VH3, VH1) of the seven human Ab VH families (for a complete classification, see VBASE), with many of the VH genes belonging to the VH5 family (12/29 cases) with a preferential use of the DP73 segment (10/29 cases). Interestingly, this was the only VH gene segment selected from all three libraries, indicating the possible preferential usage of this segment in the autoimmune response to tTG. This is in contrast to the VL sequences, which appeared to be completely random, with Vκ and Vλ chains belonging to many of the 10 Vλ and 6 Vκ families being found. The overall ratio of replacement over silent mutations of both VH and VL domains (Table II⇓, columns 4 and 7) was always higher than 1, suggesting that the mutations were the consequence of Ag-driven selections. A big difference between the scFvs containing DP73 and those containing other VH segments is that the DP73 segments appeared to be able to pair with any light chains, whereas the others appeared to pair only to specific light chains. This is particularly striking in group 3/D where a series of somatically mutated VκI/DPK9 genes are coupled exclusively to VH1/DP10 segments. As a general rule, most of the selected scFv of the three libraries show the same feature. Because during Ab library construction VH and VL regions are randomly assembled, it is likely that these coselected VH/VL pairs represent cases where heavy and light chain both need to be present for binding to occur, and hence may mirror the in vivo pairing, whereas those scFv containing DP73 appear to be able to pair with any light chain and so presumably have most of the binding activity located in the heavy chain. These results are in contrast to those obtained when similar selections were conducted on a naive library made from PBLs from 40 different healthy donors (12), in which of 12 scFvs selected, only two VH5 gene segments were found, and both of these were derived from the COS-25 gene. The remaining 10 scFvs had one VH2, four VH3, and five VH6 VH genes, whereas the VL genes were randomly distributed among four different families (data not shown). Soluble scFv were derived from each of the IBL clones recognizing tTG, and reactivity to h tTG by ELISA identical with that shown by phage Ab was confirmed. The scFv were also tested in immunofluorescence for their reactivity to human umbilical cord histological sections (the classic anti-endomysial staining). The results were compared with the fluorescence pattern obtained with a human serum positive for endomysium. In almost all cases (Fig. 1⇓A), the scFv gave an immunofluorescence pattern identical with those of CD patients (Fig. 1⇓C), and in those cases where the scFv did not stain umbilical cord sections, the ELISA signals tended to be low (data not shown), suggesting that either affinities or expression levels were low. In Table III⇓, column 4, the subjective evaluation of the fluorescence intensity is reported. When a selected number of scFv were used in double-labeling experiments, the two images overlapped perfectly (Fig. 1⇓B). Immunofluorescence of umbilical cord blood histological sections. A, scFv to h tTG. Secondary Abs: mouse mAb to tag SV5 and anti-mouse Ig conjugated with FITC. B, Double labeling. C, CD patient serum diluted 1:200. Secondary Ab: goat anti-human Ig conjugated with tetramethylrhodamine B isothiocyanate. Scale, 65 μm. The correspondence of the scFv to the in vivo Ab repertoire was further confirmed by competitive ELISA. Patient sera positive for tTG were serially diluted from 1:50 to 1:400, mixed with scFv diluted 1:10, added to a microplate coated with h tTG or BSA as negative control, and tested for scFv binding. Five scFv representative of the different groups were tested and all showed a reduction in the ELISA signals because of the competition with patient sera. The extent of the reduction ranged from 10 to 80%, depending on the CD patient serum and probably reflecting a difference in the titer of the specific serum Abs competing for the binding. No inhibition was observed by using a control serum from a healthy donor. In Fig. 2⇓, a typical response of two Abs with sera from a CD patient and a healthy donor is reported. The conclusion was that the patient sera contained Abs recognizing the same antigenic determinants recognized by the scFv or at least reacting to the same antigenic area. Competitive ELISA. CD patient and healthy donor sera diluted 1:50, 1:100, 1:200, 1:400 (x-axis, values not in scale) mixed with scFvs (groups 2/A and 2/D) diluted 1:10 and tested on h tTG. Secondary Abs: mouse mAb anti-tag SV5 and anti-mouse Ig conjugated with peroxidase. To determine how many different tTG epitopes were recognized by the different selected scFvs, two approaches were taken. In the first, cross-reactivity of the different scFvs to gp tTG by ELISA was determined, and it was found (Table III⇑, column 2) that only a fraction of the Abs were able to recognize gp tTG with OD values comparable to those obtained with h tTG, with negative scFvs giving OD values similar to negative controls. In the second approach, an inhibition ELISA was conducted in which the binding of different phage scFvs to h tTG coated to a plate (detected with a peroxidase-labeled anti-phage monoclonal) was tested in the presence of different soluble scFvs. Negative controls were the same phages without competitor scFv, and positive controls the inhibition of binding by soluble scFv corresponding to that displayed by the phage. In the first experiment, a single, well-expressed scFv belonging to group 2/A (see below) was tested against all phage Abs. When a reduction in OD of at least 50% with respect to the control was registered, the scFv and the phage were considered as recognizing the same antigenic region. After the first experiment, a second scFv (group 2/D, see below) was chosen from among those clones not inhibited by the first scFv and tested. After this, almost all clones could be grouped into two main association groups, termed epitope 1 (Ep1) and epitope 2 (Ep2; Table III⇑, column 3). Only three (10%) of the clones could not be assigned to either of these groups and are reported in Table III⇑ as “x.” Clones recognizing Ep1 could be isolated from all three libraries (groups 2/A, 2/B, 2/C, 3/A, 3/B, 4/A, 4/B, 4/C), and the level of inhibition caused by the 2/A scFv was almost total, with a drop of the OD value to the level of positive controls, suggesting that all of these scFvs recognized the same antigenic determinant. Although scFvs recognizing Ep2 were also selected from all libraries, the level of inhibition (caused by scFv 2/D) was far more variable, ranging from 50 to 100%, suggesting that a larger antigenic region is involved, with partial inhibition being caused more by steric hindrance then competition for the same epitope. Ep1 was recognized almost exclusively by those scFv belonging to theVH5 family. The only exception was 4/E, with two segments (VH3/DP54 and VλIII/DP10) not present in any other scFv. All scFvs recognizing Ep1 also recognized gp tTG, whereas none of the others was able to do so, suggesting that Ep1 is common to h tTG and gp tTG. The primary goal of our study was to determine the site of synthesis of the autoantibodies to tTG. Until now, CD has been immunologically diagnosed by using serum Abs to α-gliadin or endomysium. Only recently has the discovery of tTG as the autoantigen of CD resulted in a number of immunoassays based on gp tTG or h tTG (20, 23). It is generally accepted that the IgA response related to CD (anti-α-gliadin, anti-reticulin, anti-endomysium, and anti-tTG) is more specific than that of IgG (24, 25, 26, 27). It is also thought that this Ab response may originate in the intestinal epithelium (28, 29) although experimental evidence, with the exception of the induction of anti-tTG Abs by intestinal biopsies after gliadin treatment (7), has not been found. For these reasons and on the basis of earlier studies (see below), we decided to selectively amplify the IgA immune response. In the course of our study, we were able to isolate anti-tTG scFv from all three libraries from CD patient intestinal lymphocytes but from none of the libraries prepared from PBLs, even after three cycles of selection. This indicates that the anti-tTG IgA Abs are primarily synthesized at the intestinal level and the presence in the serum is probably attributable to the spillover from this source into the blood compartment. A major criticism to this approach is based on the fact that the VH-VL pairings occurring in vivo are not usually recreated in vitro, as VH and VL genes are paired at random. However, a number of findings suggest that phage Ab libraries can act as surrogates for the humoral response, or at least that part of it originating in the tissue used to create the library. In particular, most of the binding energy and specificity is provided by the VH domain rather than the VL domain, as shown by a number of cocrystallographic studies (reviewed in Ref. 30). Furthermore, in selection from very large naive phage Ab libraries (31), different Ags always selected different VH genes, whereas some VL genes were found in scFvs binding to different Ags. Also, in other libraries made from patients with autoimmune thyroid disease (32), myasthenia gravis (9), systemic lupus erythematosis (33), Sjogren’s syndrome (34), and paraneoplastic encephalomyelitis (35), the Ag specificities of selected Abs reflect the specificity of the patient’s humoral response. Our results with the anti-tTG Abs mirror these findings: selected Abs give identical staining patterns to patients’ sera on umbilical cord sections, indicating that the constructed library represents at least a fraction of the original response to tTG, and the selected scFvs mirror the serum anti-tTG response very closely. In a previous study (36), we analyzed the Ig response to tTG of a library constructed by using PCR primers recognizing all Ig classes from PBL and we were unable to isolate scFv to tTG, although Abs against α-gliadin could be selected with relative ease. This suggests that the anti-tTG responses of other Ig isotypes are also likely to be mediated at the intestinal level. Although the libraries used were small, this did not prevent selection of anti-αgliadin Abs from all six libraries, indicating that it is unlikely that library size was the reason for failure to select anti-tTG Abs from the PBL libraries. It has recently been shown that although naive B cells may make up the greatest number of B cells, the largest proportion of mRNA is derived from activated B cells (37). If, as is expected, this finding is reflected in intestinal B cells, the very high proportion of anti-tTG scFvs present in the library (as indicated by the high numbers of positive clones after a single round of selection) suggests that the V genes making up these scFvs are derived from activated intestinal B cells. The anti-tTG V gene sequences identified showed high levels of mutation, with the CDR3 of the VH5/DP73 Abs in groups 2/A and 2/C and the Vκ1/DPK9 VL genes coupled to the 3/C and 3/D VH genes showing differences clearly indicating an origin from the same original V gene. This suggests that these V genes are derived from an ongoing immune response where mutation is driven by Ag stimulation. Human VH5 is not the most commonly used variable region by the immune system to build Abs in healthy donors, although it is over-represented when compared with the corresponding genome complexity (38, 39). In our study, the selective usage of this family was found in three different patients and makes us believe it may be a common feature to the anti-tTG response of all CD patients, in contrast to those anti-tTG VH genes selected from the naive library. scFv from CD patients containing VH5 genes all recognized the same epitope, which, interestingly, is shared by gp tTG (Ep1). This raises the question of whether the selective use of this family might be related to the genetic predisposition shown by CD patients. In fact, even though the CD is associated to specific HLAs, the genetic linkage is not clear and other factors are required to account for the familial predisposition (5). Although the idea that V gene alleles may be responsible for such genetic predisposition is attractive, no common somatic mutation which could suggest the existence of a new allele potentially associated to CD, by virtue of perhaps an intrinsic recognition of tTG, could be identified. Thus we cannot exclude an epigenetic phenomenon involving a natural structural affinity of some elements of the VH5 family for Ep1 of tTG, which may play a role in the onset of the disease. As far as the other Abs are concerned, they seem to be directed to the second, less well-defined epitope, Ep2, characterized by its exclusive presence on h tTG, notwithstanding the high homology between h tTG and rodent tTG (17). The role of these two epitopes in the disease remains to be determined. The role of transglutaminases has been demonstrated in many cellular and extracellular events, mainly because of their cross-linking capabilities. Although transglutaminases are constitutively expressed in many tissues, tTG is primarily found in epithelia. Activation of tTG occurs during apoptosis, where it was originally proposed to be involved in the late phase of apoptosis, during which, by the creation of a net of cross-linked proteins (apoptotic bodies), it is thought to prevent release of the potentially toxic intracellular contents to the extracellular space. An interesting variation on this theme suggests that the role of tTG is to avoid exposure of cryptic intracellular autoantigens to the extracellular space and hence the immune system (40). Although the humoral response at the intestinal level is commonly thought to be less important than the cell-mediated response, total IgA from untreated CD patients have been shown to inhibit intestinal epithelial cell differentiation (41). It will be interesting to see whether scFvs recognizing the two different epitopes identified here have similar effects in this system. In the course of the immune response to gliadins and the autoimmune response to tTG, autoantibodies to other autoantigens have been shown to rise in active disease only to disappear when gluten is withdrawn. (42, 43). As a direct consequence of prolonged exposure to gluten, CD patients often develop autoimmune disease such as diabetes, thyroiditis, alopecia, autoimmune hepatitis, and cerebellar ataxia (44). On the basis of the responses to tTG in the IBL libraries, a large proportion of the intestinal Ab production appears to be involved in the recognition of tTG. The response to α-gliadin itself looks less relevant, especially as it is also found in the PBL library and may result from leakage of gliadin into the systemic circulation with a corresponding central response. This result raises the question as to whether the immune response to tTG is itself a risk factor for other autoimmune pathologies. Recently, a series of the scFvs described in this work were used by T. Halttunen in an in vitro fibroblast assay. In preliminary experiments (unpublished observations), these recombinant anti-tTG Abs increased fibroblast proliferation. This is in agreement with the model proposed by Halttunen and Maki (41) on the possible role of the anti-tTG IgA component found in the serum of CD patients. These authors demonstrated that murine mAbs to tTG or unfractionated CD serum IgA inhibited epithelial cell differentiation in an artificial epithelium model obtained by cocultivating epithelial cell with fibroblasts or in presence TGF-β (45). Their conclusion was that anti-tTG Abs interfered with the tTG-mediated maturation of TGF-β, and as a result caused inhibition of epithelial cell differentiation and increased proliferation. This reproduced the severe intestinal crypt hyperplasia and flattened villi characteristic of CD. Confirmation of these preliminary results will suggest that the CD humoral response to tTG is not an epiphenomenon but an important factor in intestinal mucosa damage, and hence perhaps one of the major pathological players. The availability of cloned Abs from CD patients with defined specificities will allow a detailed investigation of this point and perhaps help in answering the question: why are such Abs made in CD patients? We are grateful to Oscar Burrone and Maurizio Gasparin for helpful discussions and to Gabriella Rossi and Jessica Franzot for excellent technical help. ↵1 This work was financed by Regione Friuli Venezia Giulia (DGR 3688) and Istituto di Ricovero e Cura a Carattere Sperimentale Burlo Garofolo (Grant 31/98). ↵2 R.M. and D.S. equally contributed to the present work. ↵4 Abbreviations used in this paper: CD, celiac disease; scFv, soluble single-chain variable fragment; tTG, tissue transglutaminase; IBL, intestinal biopsy lymphocyte; gp tTG, guinea pig tTG; h tTG, human tTG; CDR, complementarity-determining region; MPBS, 2% nonfat milk in PBS. Tomlinson, I. M., S. C. Williams, S. J. Corbett, J. P. L. Cox, G. Winter. 1996. VBASE Sequence Directory Medical Research Council Centre for Protein Engineering, Cambridge, U.K.
Scott, H., P. Brandtzaeg. 1996. Endomysial antibodies. J. Peter, and Y. Shoenfeld, eds. Autoantibodies 237 Elsevier Science, Amsterdam. Unsworth, J.. 1996. Reticulin autoantibodies. J. Peter, and Y. Shoenfeld, eds. Autoantibodies 684 Elsevier Science, Amsterdam. Sblattero, D., F. Florian, T. Not, A. Ventura, A. Bradbury, and R. Marzari. 2000. Analyzing the peripheral blood antibody repertoire of a celiac disease patient using phage antibody libraries. Hum. Antibodies. In press. Ventura, A.. 1998. Coeliac disease and autoimmunity. S. Lohiniemi, and P. Collin, and M. Maki, eds. Changing Features of Coeliac Disease 67 The Finnish Coeliac Society, Tampere.